When she was pregnant with me (her first child), my mother was stricken with preeclampsia, a pregnancy-induced hypertension. Her body did not recognize me as a fetus, and her immune system responded as if I were a virus or a toxin—something to get rid of. This severely endangered her life as well as mine. The only course of action was to deliver me by emergency cesarean section. I was born in a small hospital in Santa Maria, California. A team of NICU surgeons flew to Santa Maria from Fresno to deliver me. Then they airlifted me to Fresno’s larger, better-equipped hospital with a state-of-the-art NICU, where I remained for eight weeks. I weighed a mere two pounds, six ounces. I was kept alive in an incubator. IV needles were jabbed into my scalp; feeding tubes were shoved down my nose. I needed a respirator to breathe. Today, I am a healthy, happy, “normal” 28-year-old, with little evidence of my harrowing premature birth. Still, it is a part of my history, something I think about often—especially in regard to my writing. Here are the lessons my birth has taught me about writing . . . and about life. The stories we tell ourselves are important. Cold hard facts are not as important as the way we choose to interpret them. My fact: I was born incredibly sick, tiny, and vulnerable. Since I don’t remember my birth, I rely on my parents for the story. They could have chosen to tell it in a light of weakness or victimhood. Instead, they have always used the facts as an example of my inner strength and fierce will to live. My dad likes to remember the surgeon who delivered me saying, “Your daughter is a fighter.” My mom talks about the relief she felt upon hearing my first cry—not feeble, but strong-lunged. First the story was told to me; later I began to tell it to myself. As I grew up, my identity as a preemie became my own personal motto: P.A.S.T. for “Preemies Are So Tough.” Still today, I draw upon the story of my birth when I am feeling lost, overwhelmed, anxious or discouraged. I remind myself that I am a preemie; I am a fighter; I am tough. Life’s hardships seem less intimidating when I think of all I have already overcome. What challenges have you overcome in your life? What stories are you telling yourself? Are they stories of strength and perseverance, or stories of weakness and disappointment? How can you shape your self-talk into words of empowerment? The story of my birth also reminds me of the deep importance of stories as a whole. Stories change lives. Stories heal people. Stories connect and embrace the world. The story I tell myself about being a preemie has shaped my identity—indeed, has shaped my life—more than anything else. And it continues to do so. Pay attention to inner dialogue. Just as you should pay attention to your own inner dialogue—to the stories you tell yourself—you should also pay attention to your characters’ inner dialogues. Life is not straightforward; it is complicated and chaotic, and often there is no “right” answer to a problem. When fictional characters always make seamless decisions and never second-guess themselves, they may not feel authentic to the reader. What is your character wondering or worrying about? What does your character wish she had done differently? If your character could look into the future, what would he be most curious to know? Moreover, you can use inner dialogue to show the complexity of your characters. Reflecting on my birth reminds me that people are not static and neatly categorized; we often feel a jumble of emotions at once. When I was born, my parents were ecstatic but also terrified. (I imagine most parents feel this way, not only parents of preemies!) As a preemie, I have built my identity as a tough and resolute person—but I don’t always feel that way. Sometimes I doubt myself, feel incapable, or sink into self-pity. Likewise, your characters have individual personalities and traits; don’t let them become caricatures. Brainstorm a list of the top four or five adjectives you would use to describe each character. Now jot down a scenario in which they might embody the opposite of each of those words. You need not include these scenarios in your actual story, but they may serve as a useful reminder that your characters are complex and nuanced people. Dig deep into your characters’ histories. Do not only focus on who they are now, or even in the recent past. What are their early memories? What are their deeply-held pains and cherished triumphs? What are they proud of—or ashamed about—in their histories? Exploring these questions will help you get to the heart of your characters’ lives and delve into what truly matters to them—and why. Many people I encounter in my daily life are not aware that I was a preemie, and yet this aspect of my past has inexorably shaped the adult person I am today. In what ways do your characters’ pasts affect their present lives? In addition to personal histories, think about family histories. What traditions have been passed down through your character’s extended family? How does your character feel about his or her ancestors? These can be physical characteristics, formal traditions, or even thought patterns and emotional legacies. For instance, a character who has never raised his hand against anyone, and yet has a family history of violent crime, will be affected by that heritage in his thoughts and actions. It is also important to note if your character has a lack of knowledge about her family history. What mysteries are shrouding the past? What memories might pop up suddenly in your character’s unfolding storyline, juxtaposed with the events and conflicts of the present day? Writing can be difficult, but it is a gift. Occasionally, I go through periods of writer’s block, where my “idea well” seems utterly dry and tumbleweeds blow by the desolate terrain of my creative imagination. In these periods, sitting down to write feels like the hardest thing in the world. Even when my writing is going well, it can still be scary—first drafts seem like dog-paddling in the middle of an immense body of water, slogging towards a hazy shoreline. Sitting at my computer and taking a few strokes forward on my novel-in-progress is much harder than pretty much anything else I could spend my time doing: cleaning my kitchen or reading a book or brainstorming a quick blog post. Writing is difficult. Revising is difficult. Querying agents and editors is difficult. Putting yourself out there is difficult. Rejection is difficult; criticism is difficult; rewriting again and again is difficult. And yet, it is helpful to remember that none of these things are as difficult as so many challenges that people go through every day. Things like cancer. Divorce. Job loss. Car accidents. Hunger. Poverty. Domestic violence. Homelessness. Grief. Writing is not truly difficult, not in that sense. Writing is an incredible gift—the opportunity to sit down with ourselves in the quiet of our own minds; to escape into new worlds of our own creation; and to perhaps share the magic of our invented worlds with others. When I catch myself sinking into the this is so hard! 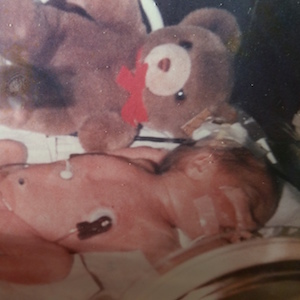 thought-cycle about my writing, I remind myself that writing is nothing compared to my fight for survival as a preemie: breathing with help from a respirator, being hooked up to feeding tubes, having my infant heels used as pincushions to draw blood. The story of my birth helps me shift my perspective, step backwards and remember the bigger picture. What gifts has writing given you? What are you grateful for in your writing life? Jot it down on a piece of paper and hang it above your desk, or type it into your screen-saver, where you will see it often. I have found that gratitude is powerful fuel for the fire of motivation. Hanging above my writing desk, I do not have words. Instead, I have a photograph. It is of a tiny newborn in an incubator, hooked up to an array of tubes and wires and monitors. She is accompanied by a small teddy bear that is about her size. I still have the teddy bear. When I hold it in my hands, I could be holding my newborn self. So fragile. So strong. So filled with possibilities. The preemie I once was spurs on the writer—and person—I am becoming. Dallas Woodburn, a recent Steinbeck Fellow in Creative Writing, has published fiction and nonfiction in Zyzzyva, Conclave: A Journal of Character, Fourth River, The Nashville Review, The Los Angeles Times, North Dakota Quarterly, and Monkeybicycle, among many others. A three-time Pushcart Prize nominee, she won second place in the American Fiction Prize and her plays have been produced in Los Angeles and New York City. Her short story collection was a finalist for the Flannery O'Connor Award for Short Fiction, the Augury Books Prose Award, and the Horatio Nelson Fiction Prize. 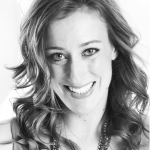 She is the founder of Write On! For Literacy, an organization that empowers young people through reading and writing endeavors.